In my last post about emerging winter stoneflies, I left the stonefly nymph hanging on a rock with the stonefly partially emerged from its nymphal skin. 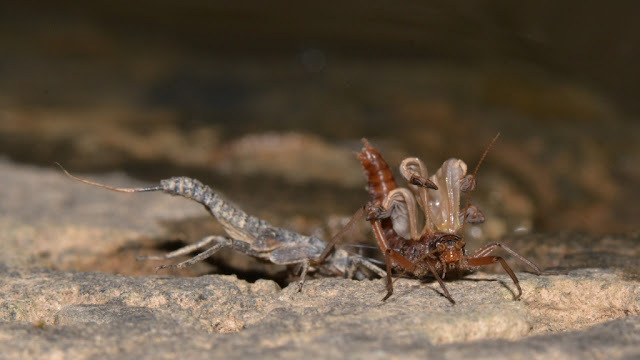 The nymph had crawled out of the water and hung on the rock and as it dried out the "skin" split open and the stonefly began to "hatch". Here is a photo of the emerging stonefly a little further along in its efforts to extract itself from its old way of life. At this point, from what I could observe, the stonefly flexed its abdomen (arches it) up and down and in this way it wiggled out of its drying nymphal case. 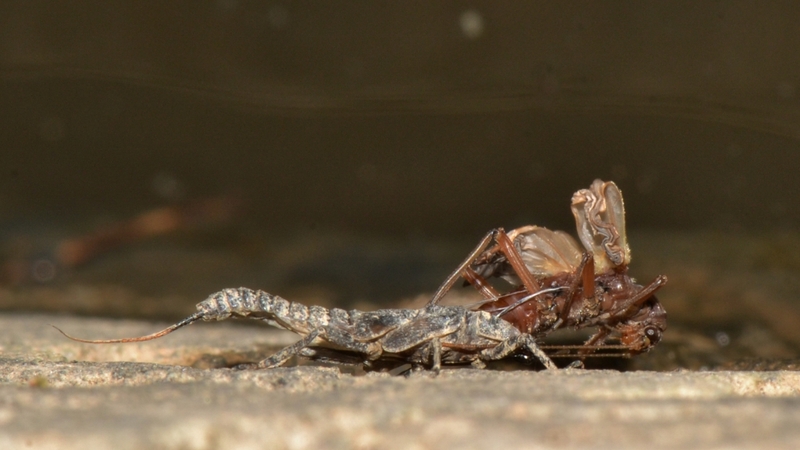 Here is a short video of the emerging stonefly doing just that. 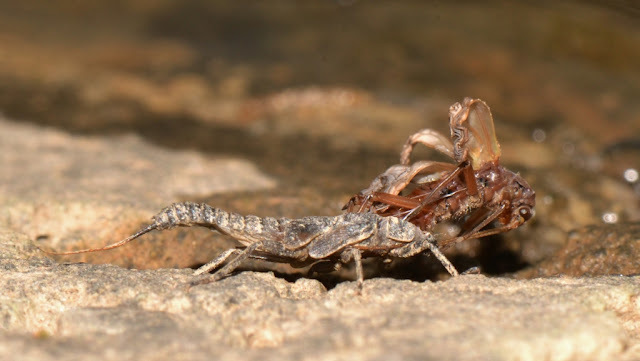 In the video the stonefly began to flex its wings and they started to slowly unfurl. Here are some more photos of a stonefly emerging... leaving behind its aquatic stage. One of the boys said at this point, "it looks like a cross between a grasshopper and a lizard". Here's another photo of the emerging stonefly .... notice the legs are now free to move around, the wings are expanding, and the antennae are, well, very reluctant about leaving the old case behind. 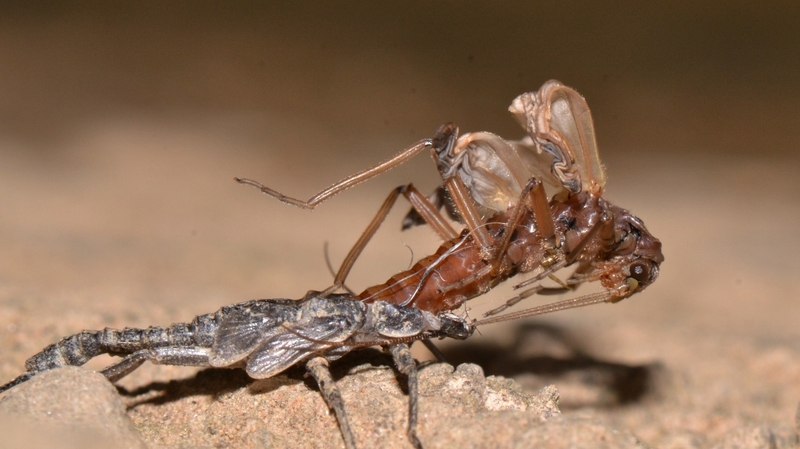 Stonefly antennae are rather long and delicate... Wow! look at that extraction process! I wonder if you could pluck a high note on those antennae at this point in the process? After the completion of that delicate antennae extraction process the stonefly rears back and waves its legs and antennae (see the video below) ... and its not long before it is free. 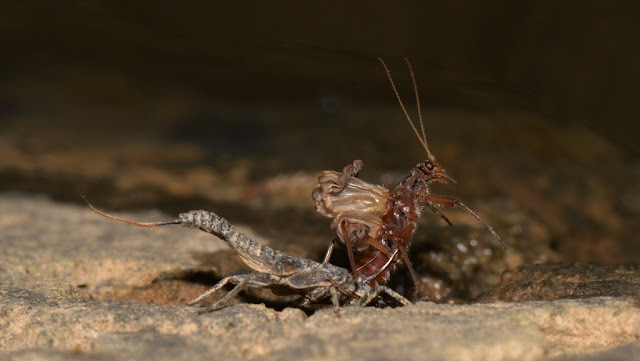 This next photo of an emerging stonefly captures a look of awe, I think anyway, as the stonefly meets the new world it has just entered. 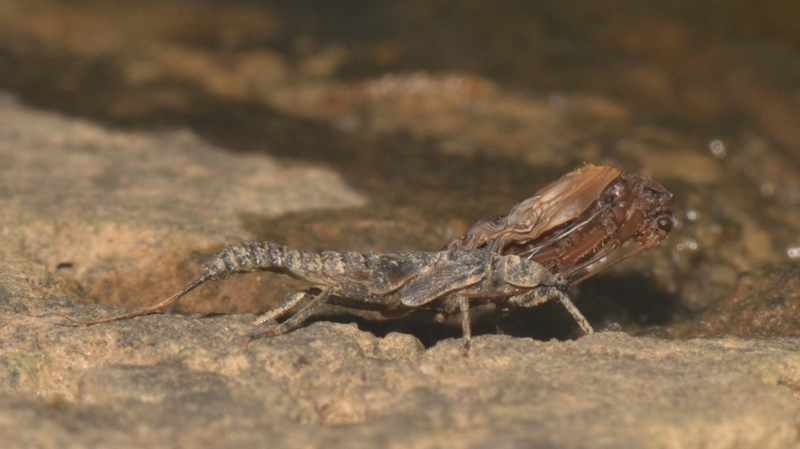 Watch this video of the stonefly as it "hatches" and leaves its "shuck" behind. 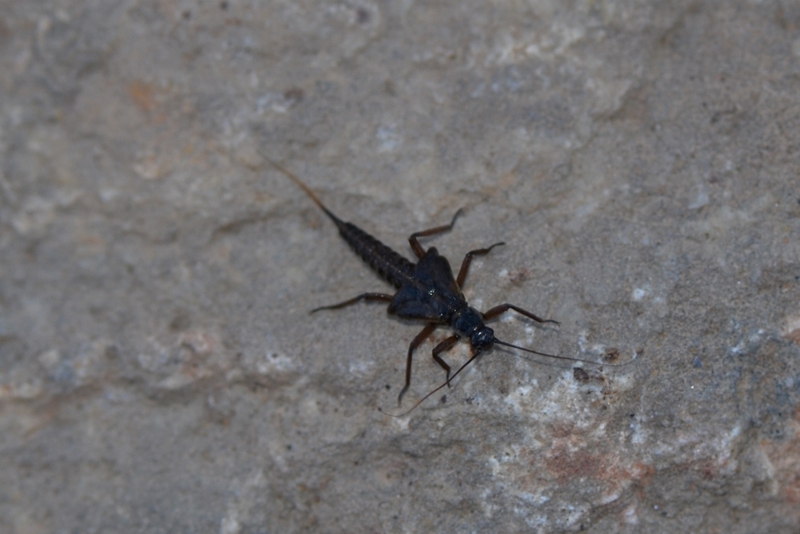 Behold, a brand new stonefly! 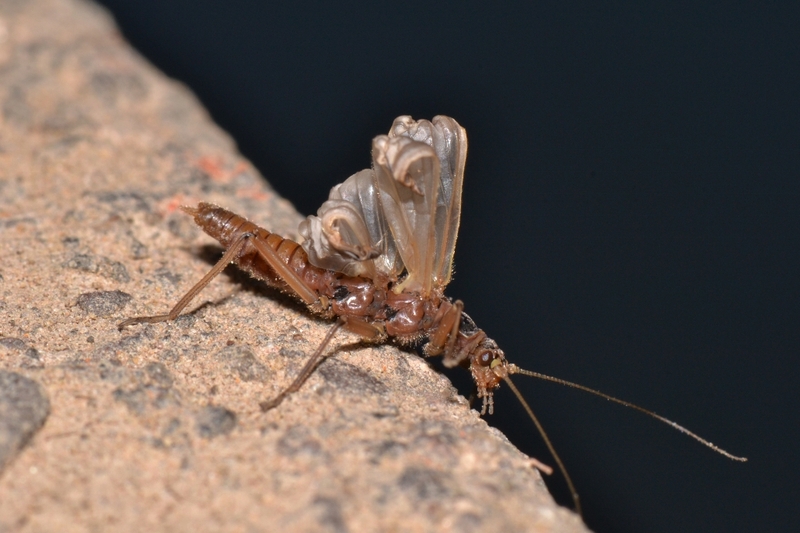 Back a couple of years ago, I posted a series of photos of stonefly wings unfurling. Check it out! What an incredible feat... what a display of the Creator's genius! 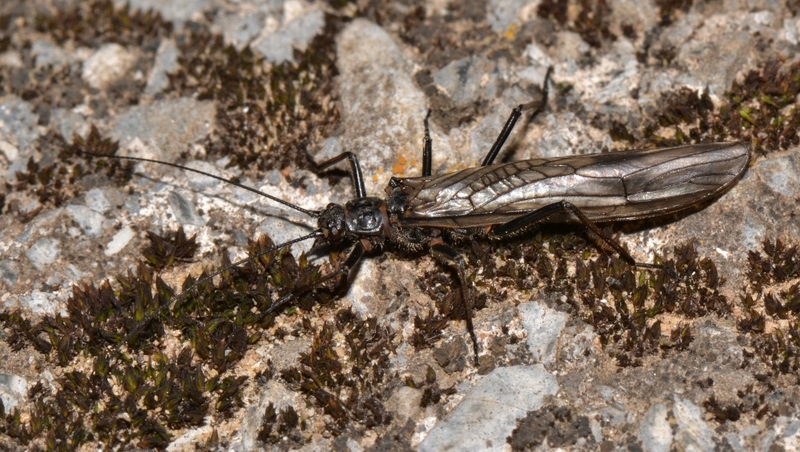 ...after a few more minutes, when its wings are finished unfurling, this recently emerged stonefly will look like this adult winter stonefly. 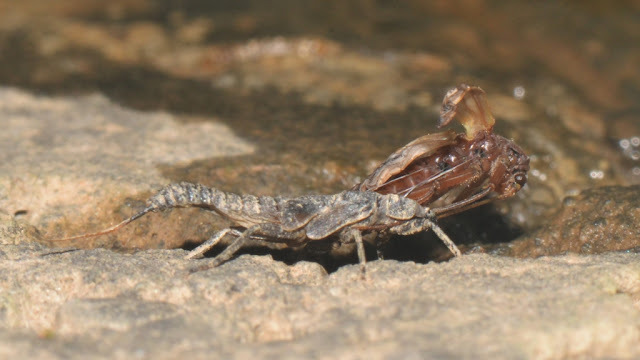 With its transformation complete, the winter stonefly can now scurry around our yard, crawl around on the snow, or go skimming across the surface of the water as it searches for a mate. Yeah for living close by the water's edge!